It sounds like you won’t have to wait until Microsoft’s Build 2017 event to get Microsoft's Windows 10 Creators Update onto your system. 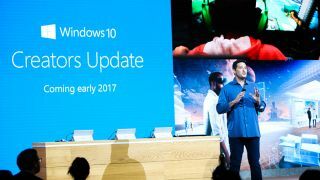 Microsoft expects to launch the next major update to Windows 10 on April 11, unnamed sources have leaked to MSPowerUser. Citing three sources “who are close to Microsoft’s plans,” MSPowerUser reports that the rollout of the Creators Update – called "Redstone 2" internally – will begin on April 11. The keyword here, of course, is “rollout”. You see, even if this report turns out to be true, not everyone is expected get the Creators Update exactly on its purported April 11 release date, but rather Microsoft will release the update in waves. (And on PC devices first, at that.) This is to avoid overloading its servers with concurrent downloads, thus providing a smooth download for everyone. MSPowerUser goes on to note that, report or not, this release date is not final, having been sourced from those close to Microsoft, not from an announcement or promotional materials. However, the outlet suspects that, based on this information, Microsoft will sign off on the final Creators Update build come mid-March, meaning Windows Insiders – basically, beta testers that anyone can join up with – should be able to try out the near-final version shortly thereafter. The Creators Update is expected to bring a host of conveniences, creativity tools and gaming improvements to Microsoft’s comeback operating system (OS). Improvements to the OS’s transparency and privacy protocols are also expected, so we’re waiting with bated breath for this major, creativity-focused update. Even still, MSPowerUser anticipates an even bigger update from Microsoft for its internally-named “Redstone 3” release during the fourth quarter of this year. That would break Microsoft’s cadence of releasing smaller updates in the autumn or winter and larger ones in the spring or summer, so we’ll be on the lookout for this next one especially so. We've contacted Microsoft for comment, and will update this story should we receive one.